Today, I used cherry tomatoes to make tomato confit which I then tossed with olives and capers to make a delicious, summery pasta sauce. I know all too well that the word confit may seem scary, but I assure you, the process couldn’t be easier. Confit simply means to cook something in fat at a low temperature for a long period of time. 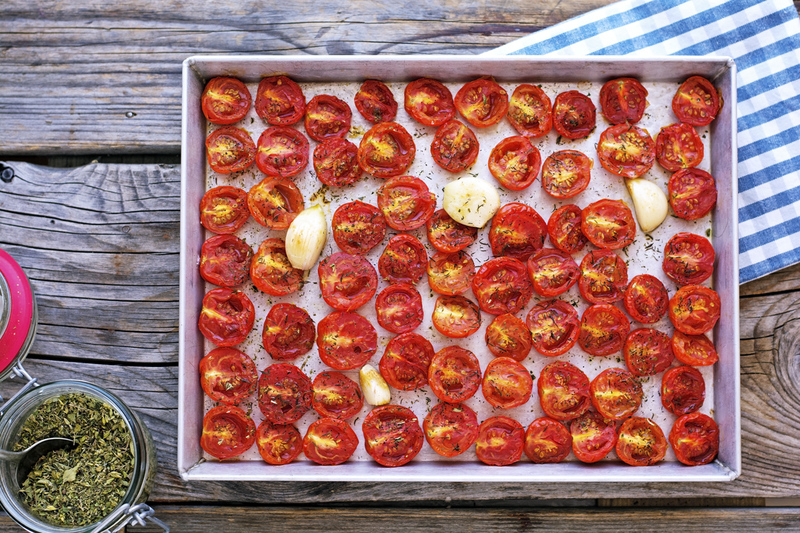 If you have never made tomato confit before, prepare to have your mind blown. These little suckers become so flavorful you might think someone snuck into your oven and doused them with artificial flavors. As they roast the tomatoes with soften and blister, releasing some of their juices. They come out of the oven with the right level of moisture: a little dry on the outside but with plenty of juiciness on the inside. The tomatoes have a wonderfully concentrated sweet flavor which is balanced by the briny and salty touch of the olive and capers. This is truly a spectacular sauce for pasta but can be used as a condiment for steak, chicken, sandwiches, salads or crostini. I’ve made this pasta (sometimes with zoodles) many times and it’s always been a success. 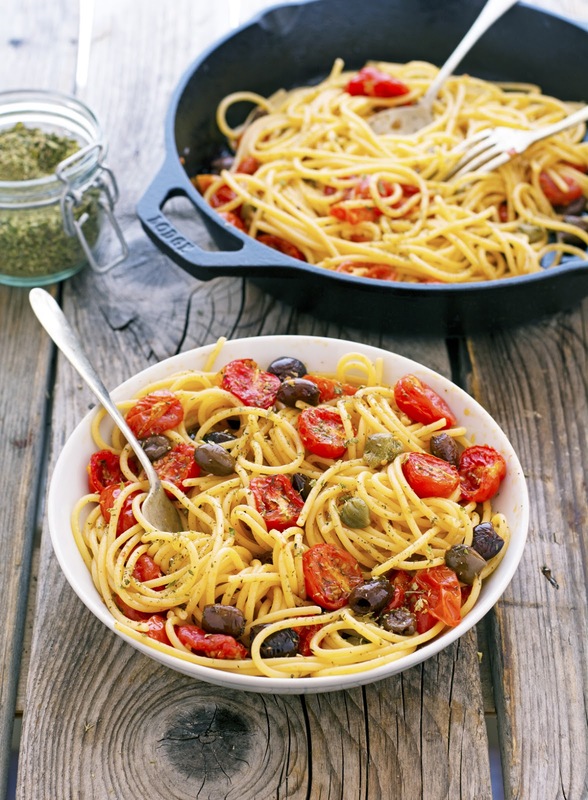 A super tasty pasta dish, perfect for the summer. Trust. 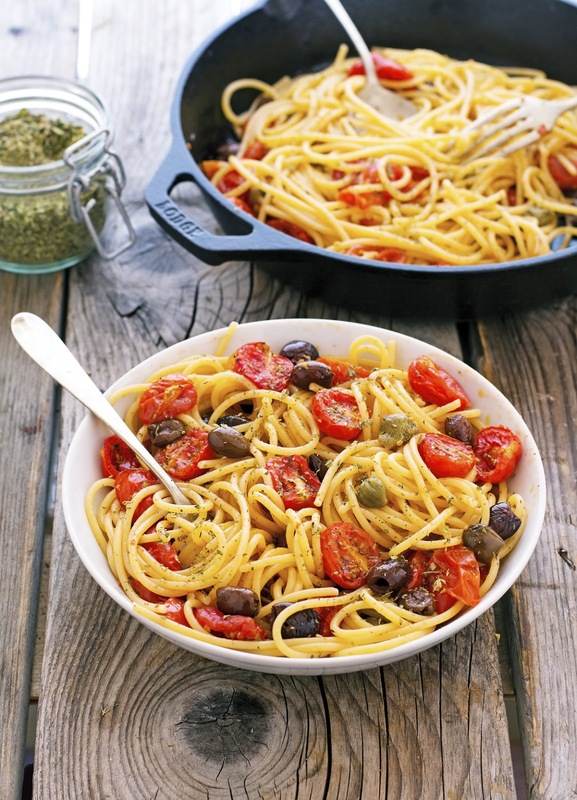 Tomato Confit Pasta with Olives and Capers Print this recipe! Preheat oven to 325°F (160°C) and place a rack in the middle. 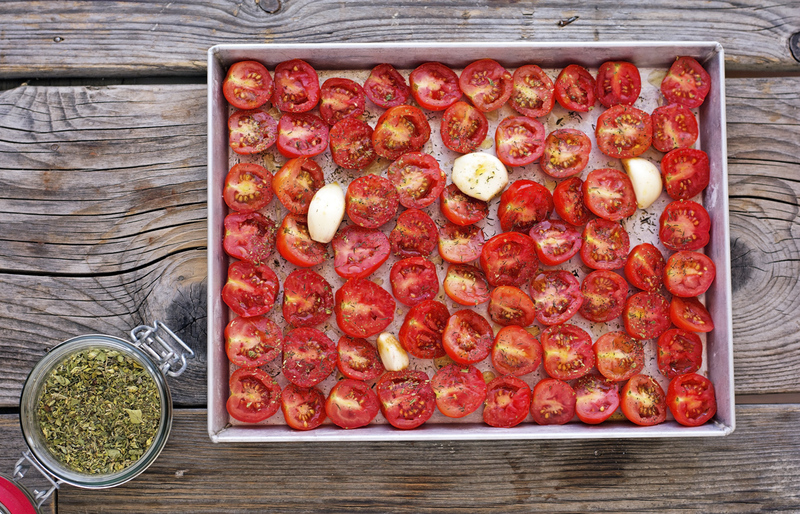 Arrange halved tomatoes on a parchment-lined baking sheet along with the cloves of garlic. Drizzle with olive oil and sprinkle with herbs. Season with salt and pepper, but go easy on those as the roasted tomatoes will be packed with flavor. Roast for 30 to 40 minutes, or until the tomatoes are soft and wrinkled. Remove from the oven and transfer to a large bowl. Add olives, capers, and toss to combine. Bring a large pan of salted water to a boil and cook pasta “al dente” (it should retain a bite). Transfer cooked pasta to the bowl with the tomatoes and toss to combine. 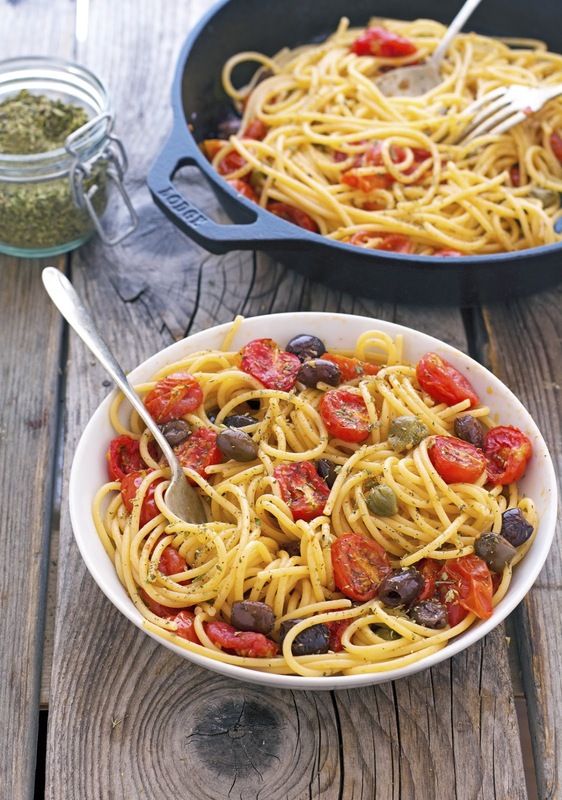 Divide pasta between 4 bowls (or plates), finish with a drizzle of olive oil, and a pinch of oregano. One serving yields 374 calories, 12 grams of fat, 57 grams of carbs, and 6 grams of protein. This looks delicious. Our cherry tomato plants are producing like crazy this summer. I am always looking for new recipes to use them in. Gorgeous and simple! Love that you're featuring seasonal fresh produce :) Pinning! Wow. This recipe looks perfect to try at home and I believe that following your guidelines and tutorial, I will be able to make it at my own home. I can eat cherry tomatoes like candy in the summer! Love this simple recipe, which would be perfect for any night of the week.